Given simple function; if I merely console log "context" I get a log back with the parameters in tow, but if I specifically console log (or otherwise reference) a single parameter as per the example below, I am presented with this firestoreInstance.settings error. If anyone can point me in the right direction please I'd appreciate it. EDIT--- So it appears to be intermittent. I fired off a message and then waited and fired off another - one returned the error, the other returned the desired result. Maybe it's linked to timestamps (server timestamps)? And it appears we're back to the errors again - occasionally one goes through successfully. Could delays in backgrounding / prolonged observer subscription cause issues like this? For the record, I tried deleting the token in between messages and that was caught as it should be. I added some characters at the start of the device token and it returned the usual error - I will continue testing, maybe if the token is invalid and requires renewal this is the error you get? My uninformed conclusion would be that there's a cold start on functions before they are formalised in some sort of caching method - and maybe I am getting the intermittent errors due to testing in between those "solidification" moments. As you can see it goes from error to delayed to pretty much instant. Still would love some clarity on the subject if someone in-the-know has some. After updating firebase-admin to the latest version (5.13.1) it's working correctly. It seems that firebase-functions v2 need firebase-admin version 5.13.0 or above ! How to add child to a List in Firebase Realtime Database with a cloud function? 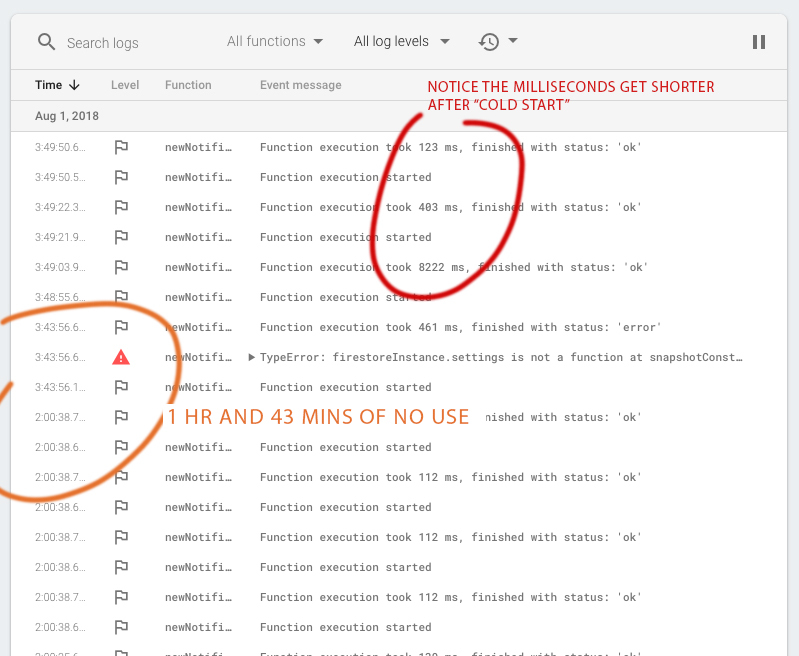 How can I execute an add to Cloud Firestore in Cloud Functions through routes in Angular?